When building a gridwall display grid connectors are a must have to complete the job. We offer a variety of gridwall connectors to help you construct the most functional gridwall fixture. 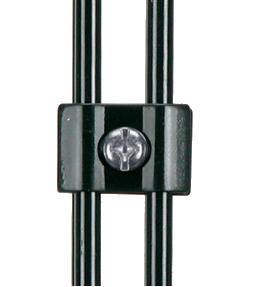 Our wire grid connector clips are available in black, white and chrome finish to match your gridwall panels. We also offer grid wall mounting brackets which will allow you to mount the gridwall panel onto the wall. Gridwall mounting brackets are also available in black, white and chrome to help you match the existing grid panels. If you need assistance selecting or have any questions about gridwall connectors or grid wall mounting brackets, please do not hesitate to contact us and one of our product specialists will assist you.